Hi trick lovers, today we are going to tell you a cool “Idea Free Internet Trick of March 2016“, the trick is working in many states in India. So read the article thoroughly and enjoy the free idea internet. The trick we are going to tell you in this article is very simple and easy to use, any person without much knowledge about these type of trick can easily use and enjoy internet with these cool trick of idea internet. This idea trick is working 100% and you can get your free idea internet in several easy steps. This is the latest idea working internet trick of march 2016, try the trick and tell us in comment box whether it is working in your state or not. So let’s have a look on this cool working idea internet trick of march 2016. So first of all we will tell you working idea 4G internet trick of march 2016, So let’s learn how to use idea 4G internet for free. Idea is going to launch 4G internet service soon, so it is offering 1GB 4G internet for free to its users, yes you can also have free 1GB 4G internet on your mobile phone or PC. To grab this awesome internet offer from idea just follow the easy steps given below to use idea 4G internet for free on your phone or PC. Enter your name and mobile number. Now submit your request and you will get an sms for idea 4G free internet. That’s it you are reserved for free idea 4G internet. Yes you can easily get 1GB idea 3G internet for only rs. 1 on your mobile phone or PC, just follow the steps given below to use this cool trick and enjoy free idea 3G internet. First of all download and install My idea App in your phone from play store. 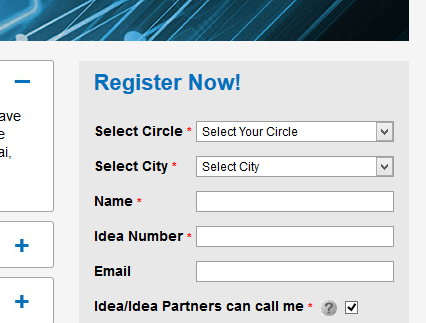 Register your new account with your idea number. Here you have to pay 1 Rupee only for 1GB 3G internet. When you are done, you will get your free idea internet in your sim, enjoy. The trick given below is currently working in some states including Maharashtra and Gujarat etc. You can try this trick and tell us in comment box whether the trick is working in your state or not. So let’s have a look on this cool proxy based idea free internet trick. The trick have some requirements to use it, so first of let’s see trick requirements. Your balance should be less than rs. 1. First of all create a new access point using the information given below. to create an access point in Samsung android Go to settings > more networks > mobile networks > Access point names. 2. Save this APN settings and enable your data pack. 3. That’s it, now you can surf idea internet for free. Note: For using internet on PC, you must have Net setter with activated idea sim. To use free internet on laptop or personal computer, you just need to edit your browser’s settings. You can use free internet on all the key browsers like Mozilla, Chrome, Opera etc. Use the settings given below into your browser and enjoy free idea internet. You can do so by going in your browser’s settings. Save these settings and restart your internet browser, that’s it now you can use free internet on PC. So these are the three working Idea Free Internet Trick of 2016, enjoy these tricks and tell us in comment box if you have any query. Enjoy this Idea Free Internet Trick of 2016 and share it with your friends and tell them how they can easily get idea 2G/3G/4G internet for free. We often update these all tricks, so you can follow us on social media, subscribe to our blog via email to get instant updates on all tips and tricks. Enjoy this Idea Free Internet Trick of 2016 and share it with your friends and tell them how they can easily get idea 2G/3G/4G internet for free.